Product categories of Racing Drone, we are specialized manufacturers from China, Racing Drone, Outside Racing Drone suppliers/factory, wholesale high-quality products of Inroom Racing Drone R & D and manufacturing, we have the perfect after-sales service and technical support. Look forward to your cooperation! Racing Drone is a drone for racing. A race drone can fly very fast outdoor and for many races. Racing drones have Drone Frame, Drone Motor, Drone ESC, camera, propeller, landing gear, battery, image and other parts. We have F210 Racing Drone, B210 Racing Drone, IF90 Mini Racing Drone, indoor Octopus90 race drone, IF88 Mini Drone, IF90 pro TRF. You can hop to catch up with your fellows by grabbing this opportunity! 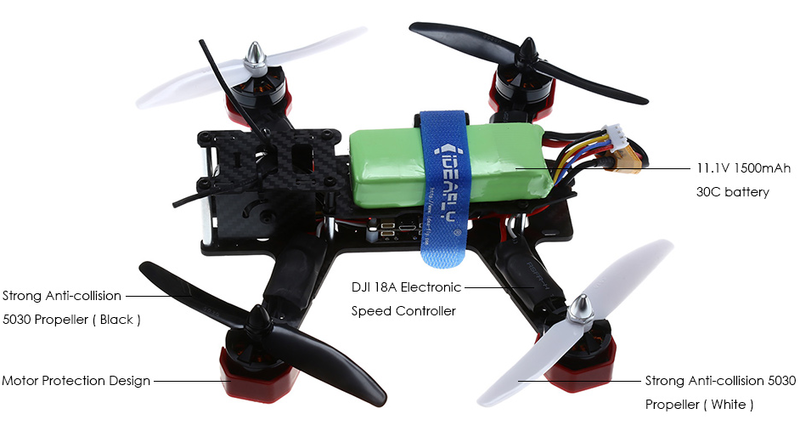 The Ideafly Grasshopper F210 Professional Racing RC Quadcopter, which boasts a super high speed of 230km/h, has been invented by Ideafly, Flycolor and Gearbest, and intended for those who want to participate in the professional race. We have researched for 6 months, revised the structural drawing for 5 times and made 10 samples to finalize the grasshopper design, for which we have already got an appearance patent. We have also involved HMM, the professional racer who has taken part in international competitions, to set the parameters and modify the design. Therefore, the much more thrilling flight is capable of meeting the professionals' strict requirements.